Gently swipe dirt and dust away from your surface! The MicroTwisted Microfiber Car Duster is a large duster perfect for gently removing surface dust, dirt, and pollen from your vehicle without fear of marring. Constructed using thousands of 4 inch long, super soft microfiber strands, tightly woven and twisted together to form a grabbing finger, the MicroTwisted Microfiber Car Duster brings the concept of a quick detail to the next level. MicroTwisted Microfiber Car Duster is perfect for use on show cars right before it’s time to shine and on daily drivers after a jaunt around town! Car dusters were created for the car owners that always want that sleek and clean finish, but don’t always have the time to dedicate to a full detail with microfiber towels and a quick detailer. Many car dusters use microfiber strands, but none of the twisted, tight microfiber fingers that the MicroTwisted Microfiber Car Duster features. The super soft, yarn-like strands are 100% paint safe and actually grab onto contaminants, removing them from the surface without dragging. 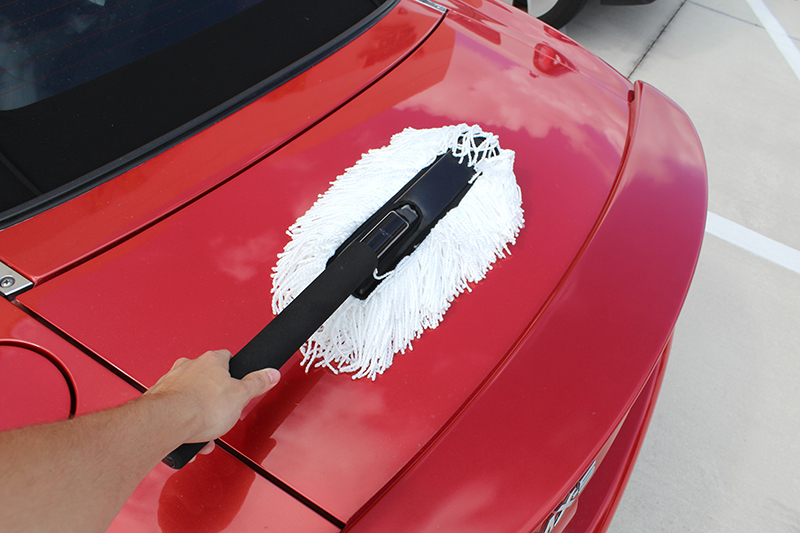 Quickly clean your vehicle of light dirt, dust, and smudges with the MicroTwisted Microfiber Car Duster! Touching your paint is the number one way to mar your paint – which means you’d want to touch it as little as possible, right? Well that’s always easier said than done. When you do touch your paint, you want to make sure you are using the right tools aka the softest microfiber products available. The MicroTwisted Microfiber Car Duster is one of the softest. Also, perfect for interior work, the MicroTwisted Microfiber Car Duster easily fits underneath your seats, or in your trunk for easy access! The MicroTwisted Microfiber Car Duster measures approximately 2 feet long, easily reaching the middle of a standard car’s roof, and features a heavy duty foam wrapped handle for comfort. The MicroTwisted Microfiber Car Duster comes packaged in its own sturdy carrying/storage case to keep your tool clean between uses. When it’s time to clean your MicroTwisted Microfiber Car Duster, simply slip the portion containing the microfiber strands off of the handle, and wash using Pinnacle Micro Rejuvenator Microfiber Detergent and allow to air dry – your MicroTwisted Microfiber Car Duster becomes brand new again! Great product. Great for dusting my ride between waxing. ProsI have been satisfied with this product.I have been looking for something like this for a while.